Our Yelm Washington customer first met us at the Puyallup Home Show. He stopped at our booth to talk to our Building Representative. He wanted to learn more about the dynamics of the PermaBilt® team . Later on, one of our monthly website specials caught his eye in regards to a large garage RV storage and boat storage building. We met with him three more times till he felt comfortable with his design and was ready to move on to building his 2 car garage for boat storage attached to his RV storage building. 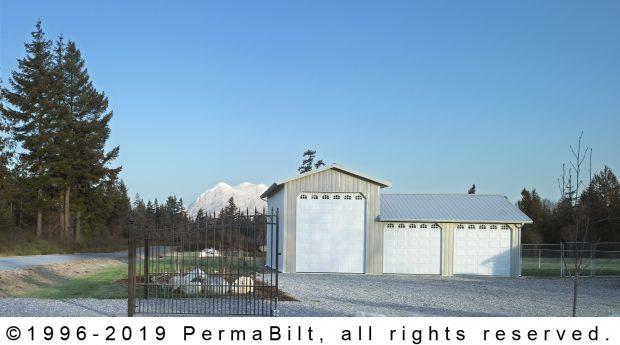 With PermaBilt’s unmatched quality, superior engineering, attention to detail and speed of constructions, our Yelm client new he could own a custom RV storage and boat storage building that would be the envy of his neighborhood and the talk of the town. PermaBilt storage buildings are stronger and able to withstand lifting winds, falling trees and other hazards better than a conventionally framed building. By allowing the roof to move as one piece, our diaphragm building design helps PermaBilt buildings keep their lines through year after year of harsh weather conditions. Our professional garage builders quickly helped our Yelm client with the design, permitting and financing for his new RV storage and boat storage building. The permitting process went smoothly and quickly. The customer then had his building site prepared and materials and our crew were scheduled. And before he knew it, the storage building was erected for his RV and boat storage so they were safe and secure for the winter months ahead.